The TV wunderkind is back with two new must-sees. When he created The O.C. 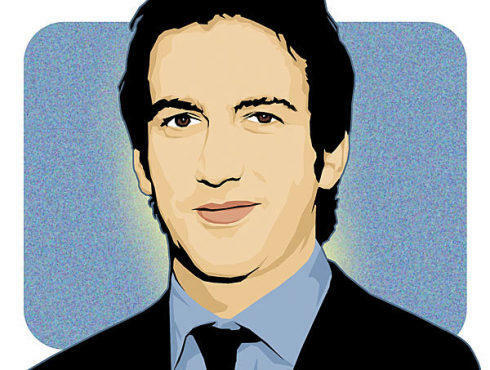 at 26, writer and producer Josh Schwartz became the youngest person in network television history to head a series. Now 31, the Rhode Island--born, University of Southern California--educated impresario is back with a pair of shows destined to eat up your TiVo storage. You've got Gossip Girl, about privileged, fast-living Upper East Side teens and the unnamed gossip blogger who tracks them (based on the popular book series), and Chuck, an action-comedy about a sweet everynebbish in the vein of The O.C. 's Seth Cohen who downloads a file of government secrets. On the face of it, the shows have little in common, but underneath they're both, yet again, about outsiders penetrating insular worlds, and they both look to be addictive as hell. We chatted with the wry and affable tubemonger by phone from L.A., where he lives with his girlfriend of three years, Jill, and his chocolate Lab, Maya. If Gossip Girl and Chuck were to get in a fight, who would win? Chuck's not a very good fighter, and I don't think Gossip Girl is afraid to pull hair. Do you read gossip blogs? Maybe there's a generational cutoff, but for the most part, why not? It beats thinking about the world. Gossip blogs have become this easy way to do something completely mindless while you're at your office. How do you make particular characters watchable even if they're very unsympathetic? Who are you speaking about? The real bitchy girls in Gossip Girl. We try to take characters that are certainly on the surface not the most sympathetic and give them problems that are relatable regardless of where you're from or how much money you have—issues of boyfriends and best friends and parents that anyone can understand. Do you think someone ever gets over being a Seth Cohen? No. Who you are in high school, there's a part of you who is that person always, and if you were the Seth Cohen in high school or college, there will always be a part of you that feels that way. That character is very much how I think of myself in almost all public circumstances. Do you think everyone thinks of themselves a little like that, though? Yes I do, and that was a surprise. It seemed like everybody really related to Seth, and I think a lot of people feel like Chuck—a guy who has a lot of potential but hasn't totally realized it yet, and maybe if greatness were thrust upon him he could step up. You achieved enormous success at age 26. Is it weird getting older and losing that distinction? As soon as I got labeled "the youngest" I thought, Well, that's good for, like, a year, and then some whippersnapper will come on up and take the title. Did you go out and buy a Porsche or do anything like that? I bought a house that was going to be my swinging bachelor pad. It was supposed to be, like, This is where it's all going to happen—now I'm finally going to be the great bachelor that I never knew how to be. About three weeks after I moved in I met my girlfriend, and we've been together for the last three years. So no, I never did that. What are you going to do if you never get a chance to go out and be the swinging bachelor that you never were? Are you worried? Is she? Is that really the same? Jeepers, we've gotten into some serious psychoanalysis. I know. I'm trying to make you cry. Who knew? Well, I think I've made my peace with the fact that I'm not that guy. Will you ever put ugly people in your shows? Wow—it's not very nice to call them that! You know, I'm not the first guy to say television should have attractive people on it. I'm not going to take the hit for that one. I didn't say you have to! Gossip Girl airs Wednesdays at 9pm on the CW. Chuck is on Mondays at 8pm on NBC.